Reservoir Capital Corp. of Canada, reports that on January 25, 2012, the Ministry of Infrastructure and Energy of the Republic of Serbia, granted three-year extensions for the Brodarevo-1 and Brodarevo-2 Energy Permits to the Company's Serbian subsidiary Renewable Energy Ventures d.o.o..
Ormat Technologies, Inc. announced today that it is revising its previously issued expectations pertaining to the impact of recently finalized mandatory short-run-avoided-cost ("SRAC") pricing applicable to power purchase agreements ("PPAs") for the Heber 1 and 2 power plants, the Ormesa complex and the Mammoth complex in California (the "SARC PPAs") may have on its revenues in 2012 and 2013. The Bureau of Land Management, Carson City District-Stillwater Field Office, is seeking public comments on an Environmental Assessment for the Tungsten Mountain Geothermal Exploration Project proposed by Ormat Technologies Inc., in Edwards Creek Valley, Churchill County, about 36 miles west of Austin, Nev. The BLM will accept public comments on the EA through close of business on February 28, 2012. KUTh Energy of Australia has been awarded an exclusive concession by the Commonwealth Utilities Corporation of Saipan to develop geothermal power and sell electricity to the transmission grid. The company has also received a US$1.1 million grant from the Commonwealth of the Northern Marianas Government to support the drilling of a 600 metre deep geothermal gradient well. Watch for the segment on Geothermal Energy with comments by the new GRC Board Director Andy Sabin, Director of the Navy Geothermal Program Office, China Lake, between minutes 6 & 7. Energy Development Corp., the country’s biggest producer of geothermal energy, is set to finally complete within the year the rehabilitation of two geothermal complexes it acquired from the government, the 150-megawatt Bacon-Manito (BacMan) and the 305-MW Palinpinon-Tongonan power plants. The completion of the rehab activities is expected to help shore up power supply and, at the same time, contribute to increasing the company’s electricity revenues. According to EDC president Richard B. Tantoco, the BacMan facilities may start full operations by September this year to generate 130 MW. The geothermal facilities were practically inoperable, with a generating availability of only 3 percent when EDC acquired them from the government in 2010. President Barack Obama's goal of approving enough renewable-energy projects on federal lands to power 3 million homes may be the easy part — getting them built could be another story. In his speech at Buckley Air Force Base in Aurora on Thursday, Obama repeated the goal he set in his State of the Union address — 10 gigawatts of renewable-energy generation on public land. "Congress needs to act," Obama told about 400 invited guests gathered in a spare hangar. "They need to pass clean-energy tax credits." Net installed capacity of the Group included 769 MW (11% of total) geothermal. Net electricity generated by the Group in 2011 included 5.6 TWh (25% of total) geothermal. Plans to set up a 400MW geothermal power generating station at Menengai has received a boost, following approval for its funding by the African Development Bank (AfBD). In an interview with the Daily Nation, Gabriel Negatu AfDB’s regional director, confirmed that at the end of last year, the board approved a Sh10.2 billion loan to fund the project. The funds are expected to be released by March this year. Like most renewable technologies, geothermal energy is awaiting clarity from Congress on the amount of federal support it will receive and for how long. But there’s a catch: projects take much longer to bring on line than Congress has been willing to extend tax credits. The wind industry is now in a panic when it sees its favored policy tool, production tax credits, expiring at the end of this year. Geothermal’s PTC lasts until the end of 2013, but that’s no less consequential. Policymakers must make more effort to de-risk geothermal exploration for investors and companies, said a vice-president at a leading US generation and utility company. Jonathan Weisgall, VP of legislative and regulatory affairs at MidAmerican Energy Holdings Company, said: "We need to de-risk this industry. The tech costs have to come down for investors too, and all the time there is the spectre of low natural gas prices. But above all we need regulatory certainty." The Energy Policy Act of 2005 extended the Production Tax Credit (PTC) to geothermal power projects after successfully kickstarting the US wind industry. Installed capacity for geothermal is around 10.7GW globally, approximately 3,000MW of which is located in the US. Last year, 123 projects were under development in the US and will receive the PTC if placed in service by the end of 2013. The geothermal community in Italy is expressing deep concern regarding the new incentives for the production of renewable electricity. The new support schemes for the period beyond 2012 are under evaluation by the government and expected to be approved by the end of February. With a little help from the government, geothermal energy has the potential to take a much larger share of the renewable energy market in the U.S. in the near future. The U.S. geothermal power industry is poised for a bit more rapid growth now that the U.S. Department of Energy's geothermal development program is maturing with demonstration-stage pilots. This acceleration of growth also will be spurred on by an increasing number of municipalities and utilities that are turning to geothermal as an alternative energy option for either renewable mandate or investment reasons, industry executives say. While the U.S. geothermal power market is still somewhat tepid in comparison to the international market, U.S. technology exports will help U.S. companies weather the wait for a more rapid domestic market expansion. Geothermal Exploration Technologies - How and where are they being used in the U.S. The Department of Energy’s Geothermal Technologies Program (GTP), in partnership with Western Area Power Administration, is offering a free one hour webinar on February 15, 2012 at 10:00 am MST entitled: Geothermal Exploration Technologies - How and where are they being used in the U.S. The scientists involved in the work suggest the precursors for an eruption – a supply of magma and an underground source of water the magma could turn to steam in a flash – may still lurk beneath the nearly 800-foot deep crater. Small deposits of groundwater could have survived the arid conditions at the time, and could well exist today, the team suggests. Based on the locations of springs in Death Valley today, the team estimates that groundwater may exist within about 500 feet of the crater floor. The Geothermal Resources Council (GRC) would like to remind the community that the GRC 2012 Annual Meeting draft paper submission deadline is April 27, 2012. Geothermal Resources Council Annual Meeting will be held Sept. 30-Oct. 3 in Reno, Nevada, USA. Lassen Peak, the southernmost active volcano in the Cascade Range, erupted explosively in 1915 devastating nearby areas and sending volcanic ash as far away as 200 miles to the east. A recently released U.S. Geological Survey map showing the Lassen Volcanic Center and associated volcanic fields in unprecedented detail is enabling scientists to develop derivative products to evaluate and assess regional volcanic hazards. In his State of the Union address Tuesday night, President Obama voiced strong support for renewable energy and an end to oil subsidies. Mentioning natural gas, wind and solar specifically, Obama called for using various types of renewable energy solutions to make the country less dependent on oil alone. “This country needs an all-out, all-of-the-above strategy that develops every available source of American energy – a strategy that’s cleaner, cheaper, and full of new jobs,” he said. The Icelandic Ministry for Foreign Affairs has made an agreement with the World Bank on collaborating on the harnessing of geothermal energy in the countries in the East African Great Rift Valley, as announced yesterday. These are Djibouti, Ethiopia, Uganda, Eritrea, Kenya, Southern Sudan, Tanzania, Malawi, Mozambique, Burundi, Ruanda, Zambia and Somalia, as stated in a press release from the Foreign Ministry. U.S. Geothermal Inc. announced today that it successfully completed the repair of production well RRG-2 at the Raft River geothermal power project in southeast Idaho. The repair work was completed by U.S. Geothermal Services Inc. under the terms of a Repair Services Agreement with Raft River Energy I LLC. THE Energy Development Corp. (EDC) of the Philippines yesterday said it had bagged a contract to develop geothermal fields in Chile. EDC was awarded the Newen geothermal contract near Santiago, Chile, EDC Chief Operating Officer Richard B. Tantoco said in a press briefing. “We were finally awarded a service contract in Chile called Newen which we applied for in 2009,” Mr. Tantoco said, explaining that the firm will now develop the steam field potential and will eventually build a power plant. EDC had set up a subsidiary in Chile called EDC Chile Limitada to bid for geothermal concessions in the country. The company is currently undertaking geological surveys in the area. "Nowhere is the promise of innovation greater than in American-made energy." "This country needs an all-out, all-of-the-above strategy that develops every available source of American energy - a strategy that's cleaner, cheaper, and full of new jobs." "... it was public research dollars, over the course of thirty years, that helped develop the technologies to extract all this natural gas out of shale rock - reminding us that Government support is critical in helping businesses get new energy ideas off the ground." "Because of federal investments, renewable energy use has nearly doubled. And thousands of Americans have jobs because of it." "We have subsidized oil companies for a century. That's long enough. It's time to end the taxpayer giveaways to an industry that's rarely been more profitable, and double-down on a clean energy industry that's never been more promising. Pass clean energy tax credits and create these jobs." "....tonight,...... I'm directing my Administration to allow the development of clean energy on enough public land to power three million homes. And I'm proud to announce that the Department of Defense, the world's largest consumer of energy, will make one of the largest commitments to clean energy in history - with the Navy purchasing enough capacity to power a quarter of a million homes a year." Click on the link below for more complete excerpts. Imperial Valley Economic Development Corp. has announced that the theme of its 2012 Imperial Valley Renewable Energy Summit and Expo is "The Power to Renew California." The fifth annual event will be held March 13-15, 2012 at the Barbara Worth Resort and Country Club in Holtville, California. A recent study by Bloomberg New Energy Finance looks at the capacity factors of geothermal power plants world-wide and shows they are not as high as they theoretically could be, but still remain an important and valid base-load capacity source of power generation. Not only does America have the (energy) reserves, the fracturing process that can unlock them has been demonstrated as safe—and equally important, not demonstrated as not safe. And the industry that uses it seeks and incorporates improvements along the way. Geodynamics' Cooper Basin geothermal energy project is set for further development after the company's capital raising program exceeded expectations. The geothermal company yesterday said its capital raising program announced in December had raised a combined $10 million after a share purchase plan raised $6.2 million and a placement to institutional investors yielded a further $3.8 million. MidAmerican Energy Holdings Co. announced it has established a new business called MidAmerican Renewables LLC, which will oversee wind, geothermal, solar and hydro projects. MidAmerican Renewables will be based in Des Moines, Iowa, and will encompass MidAmerican Wind LLC; MidAmerican Geothermal LLC; MidAmerican Solar LLC; MidAmerican Hydro LLC; and project development and commercial management. Mitsubishi Heavy Industries, Ltd (MHI) announced January 20 a policy to raise the annual sales of its geothermal power business to 18 billion yen. Geothermal power development is on the move in the world because of its low carbon nature among other factors. MHI, which holds a leading 24.6 per cent share in the world geothermal power system market, intends to expand its geothermal business in keeping with the growth of the entire market. The event is designed to bring together key players from across the energy ecosystem – researchers, entrepreneurs, investors, corporate executives, and government officials – to share ideas for developing and deploying the next generation of energy technologies. The Summit’s unique combination of leaders makes it the perfect forum for developing energy solutions that will enable America to out-innovate our global competitors. $200,000 Clean Energy Challenge Now Open! The U.S. Department of Energy has announced a new business plan competition. Starting with 6 regional competitions, the event culminates in a national competition in Washington, DC, that features a $200,000 grand prize. First Look West (FLoW) is the name of the Western Region competition, led by the California Institute of Technology. One half of your team members must be students attending an accredited U.S. university who hold (or will hold) a minimum of 20% equity in the company. Teams: Apply by February 15. The Energy Efficiency and Renewable Energy (EERE) Postdoctoral Research Awards support EERE's mission in energy efficiency and renewable energy by offering recent Ph.D. recipients the opportunity to conduct applied research at universities, national laboratories, and other research facilities. The National Geothermal Academy is an 8-week intensive summer course in all aspects of geothermal energy development and utilization. The course is offered for 6 credits at either the undergraduate or graduate level. Individual weeks are offered as professional development. In summer 2012 Modules 2,3,4 or 5,6,7 are offered as 3 credit sections. Applications are due February 15, by 5pm in the applicants local time zone. Geothermal is the Mercedes of renewable energy: it’s expensive but top quality. Íslandsbanki (the Icelanders are experts on this) give the capital cost per kw capacity at $4,000, against $2,600 for solar PV and $1,900 for wind. Since the big cost in geothermal is drilling, a mature technology, geothermal costs aren’t likely to come down as fast as those of its rivals are doing. However, with hot dry rock fracking , there is orders of magnitude more recoverable geothermal energy than used to be thought. It’s technically beautiful: reliable (95% capacity factor, beating everything else), safe, frugal with land. Geothermal resources could become California's "bread and butter"baseload power as nuclear and gas-fired plants are retired, a state commissioner said this week. Hot Rock Limited has announced the expansion of its geothermal exploration portfolio in South America, with the recent granting of the "Turu" geothermal tenement located in Southern Peru. With this award, Hot Rock now holds four granted tenements in Peru, in addition to 13 tenements in Chile. Five more tenement applications for volcanic geothermal prospects in Southern Peru remain in processing and are expected to be granted this year. Here’s a sobering sign of the challenges facing the geothermal industry: Even Warren Buffett has spent the better part of a decade trying to build a single geothermal power plant in California. MidAmerican Energy Holdings Company, which is controlled by Buffett’s Berkshire Hathaway, received the green light from state regulators back in 2003 for its 159-megawatt Black Rock project in the desert east of San Diego. But by 2008, MidAmerican’s CalEnergy subsidiary had yet to break ground on Black Rock as required by its license, and with the economy in free fall as the financial crisis took hold the California Energy Commission granted the company a three-year extension to begin construction. The Bureau of Land Management (BLM), Carson City District, Stillwater Field Office, issued on Thursday the Decision Record (DR) for the final environmental assessment (EA) for the Dixie Meadows Geothermal Exploration Project proposed by Ormat Technologies, Inc. The decision is for the BLM to implement the Proposed Action alternative. The geothermal exploration project is in Dixie Valley approximately 75 miles northeast of Fallon. 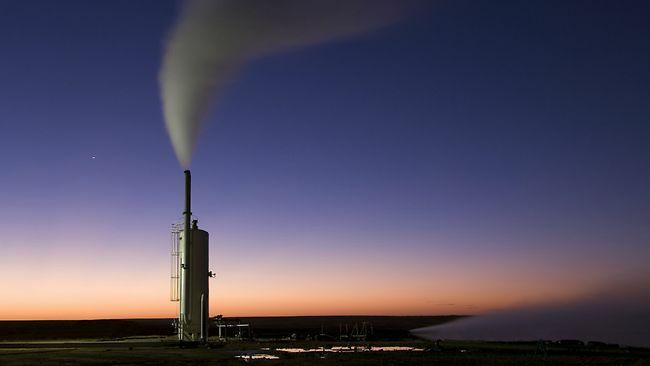 Churchill County has made the economic growth potential connected with renewable development tangible by investing $12,6 million from geothermal energy harnessing revenues within its boundaries since 2005. Indeed, the local government has used a portion of this sum to refurbish the airport, provide firemen with new vehicles and ensure the water supplies that are necessary to make the geothermal energy plants work and for the needs of the dairy breeding sector. Two hundred leaders from the geothermal industry, the finance community and government agencies met yesterday at the Geothermal Energy Association (GEA) fourth annual Finance Forum (supported by the GRC), held at the Marriott Marquis San Francisco. The event focused discussions on the issues and opportunities in geothermal including how to accelerate the slow growth of the industry, whether Congress will extend tax incentives, how to improve project economics, and more. Össur (left) and Baconschi in Bucharest. Icelandic Minister for Foreign Affairs Össur Skarphéðinsson met his Romanian counterpart Teodor Baconschi in Bucharest yesterday, suggesting geothermal energy projects in the country and closer cooperation between Iceland and Romania. Össur suggested using funds from the EFTA Development Fund, to which Iceland is party, to launch geothermal energy projects in Romania; in the western part of the country there are territories suitable for establishing heating utilities. Baconschi said he supported such projects. Listen to the interview from the beginning to 8:38 minutes in. "You're listening to Science Friday. I'm Ira Flatow." "We here at Science Friday are constantly on the lookout for cool, innovative, renewable energy ideas. And when we came across these next two, we knew - I just knew I had to share them with you." "Our first one, we go to a dormant volcano in Oregon. It's the site of a renewable energy project that involves hot rocks, millions of gallons of cold water and cutting edge geothermal technology. Susan Petty is the president and chief technology officer for AltaRock Energy, one of the collaborators on this project. She joins us from Seattle." The innovations with the lowest patent and claim productions for 2010, and which illustrate areas of possible opportunity, were smart grid technologies, geothermal, and CO2 storage. Reservoir Capital Corp. has reported that GeothermEx Inc., a Schlumberger Company, has completed an independent review of the Company's Vranjska Banja Geothermal Project in southern Serbia, concluding it could potentially support a power generation project of up to 20 Megawatts ("MW") in size, utilizing a binary-cycle power plant. Enel Green Power (EGP)’s geothermal energy leadership includes technological innovation, specially low-temperature binary cycles and geothermal combined with solar power. Geothermal energy is among the low-carbon energy sources with the highest growth rates. At present, 24 countries in the world are using it for electricity generation, and at least 60 use it directly for heating. 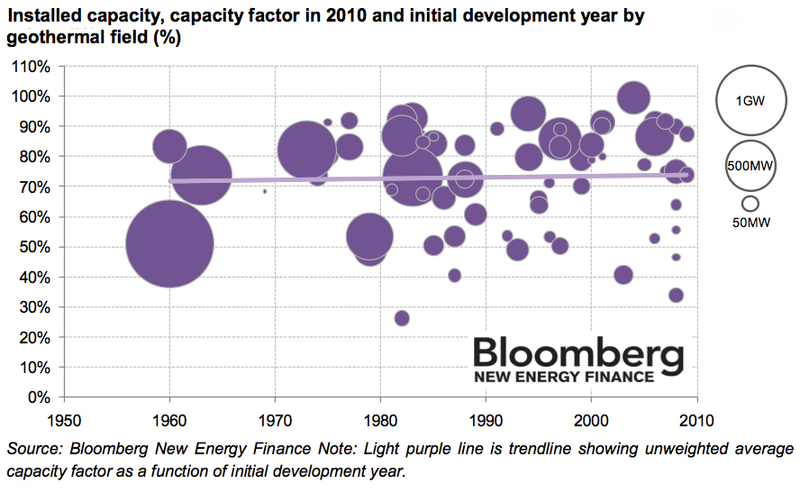 At the end of 2010, the electrical installed capacity exceeded 10,700 MW, with highly significant development forecasts, especially regarding the development of new technologies and new applications. The construction of a 280 MW geothermal plant has began and is scheduled to be completed and commissioned in April 2014. Power generating company, Kengen, yesterday said the construction of what will become the largest geothermal plant in East Africa started early this month. The Mexican International Renewable Energy Congress (MIREC) brings together the Mexican renewable energy community to drive forward this important sector at a time of unprecedented change in the market. Join us at MIREC for the inaugural GeoPower Mexico meeting, a critical strategy forum to identify emerging opportunities in this already world-leading sector. In a recent interview, John McIlveen, Senior VP of Research of Jacob Securities gave his predictions for geothermal stocks, mentioning that things look up compared to 2011 and mentions U.S. Geothermal, Ormat Technologies, Alterra Power, and Ram Power. A unanimous vote by the California Public Utilities Commission (CPUC) puts energy efficiency first in the state's quest to meet energy demand. CPUC voted to strengthen the "loading order" in California's clean energy policy, which creates a priority list for electricity sources. After using energy efficiency, utilities must prioritize renewable energy to meet demand. The state can then turn to fossil fuel plants to meet remaining demand. Dominica Minister of Public Works, Energy and Ports Mr. Rayburn Blackmoore expressed gratitude to the Nevis Island Administration (NIA) for the opportunity to share in its geothermal development experiences. He told the Department of Information in an interview at the end of a meeting with Minister of Natural Resources and the Environment on Nevis Hon. Carlisle Powell on January 14th, 2012, that he held the view that both islands should dialogue with each other given the fact that they were both pursuing the development of geothermal energy. of New World Energy Limited. John Libby, Managing Director of New World Energy Limited, discusses the company’s geothermal interests in Western Australia and the Philippines, and expounds on the company’s plans for the future. What are the long-and-short term goals of New World Energy? New World Energy aims to build a mid-tier geothermal energy company with initial focus on building its Asia-Pacific portfolio, while still maintaining momentum on its Western Australian assets. Greenearth Energy has signed a funding agreement with the Victorian Government for the company's proposed 140 megawatt Geelong Geothermal Power Project. The $25 million grant was awarded under the Victorian Government’s Energy Technology Innovation Strategy. The funding will assist with two stages of the Geelong Geothermal Power Project’s (GGPP) development – the first being the establishment of a ‘proof of resource’ using $5 million in funding. Gradient Resources has started construction on the 60-MW first phase of its Patua project, with plans for vast expansion in the next few years. Amidst a year of frustrating inactivity in the geothermal industry, many are holding hope for a brighter 2012. The industry holds more than 700 MW of projects in its pipeline to be completed before the federal tax credit expires in 2013. One project that has the upper hand in this race is Gradient Resource's 60-MW Patua project, about 38 miles east of Reno, Nevada, set to go online in late 2012. Gradient has partnered with TAS Energy Inc., a technology provider, and SAIC Inc., a technology applications company. 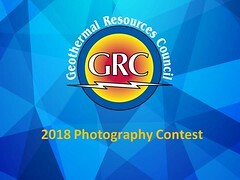 Geothermal Resources Council announces honors for the best geothermal presentations showcased at the GRC Annual Meeting. The Geothermal Resources Council (GRC) has announced the outstanding presentations from the global geothermal community for 2011. The GRC has made these available on the GRC Website. Nevis will continue to make a push on green energy, including geothermal energy, in 2012, Premier Joseph Parry said yesterday. The island has made strides in renewables in the last few years, both in the wind sector and in geothermal, the latter of which will remain a priority, he said. Brown and Secretary of the Interior Ken Salazar are expanding a state and federal partnership to expedite large-scale renewable projects. The partnership between the Department of the Interior and the state of California expedites the approval process for large-scale solar, wind, and geothermal projects (Casa Diablo IV Geothermal Development Project). Delayed geothermal projects could make it across the line this year as two SA-focused companies move further toward producing power, the industry association says. Geodynamics' well in Habanero, South Australia. Geothermal company Geodynamics plans to drill its Habanero-4 well in the first financial quarter, taking it toward producing power to Innamincka. A renewable energy company operating in Western Australia's mid-west says the region's mining industry will benefit greatly from its operations. Green Rock Energy has joined forces with New World Energy to develop a large area of the Perth basin. The joint venture estimates the basin holds several hundred megawatts of geothermal energy. Green Rock's Richard Beresford says the company plans to start extracting energy from the wells early next year. "We think there's certainly the resource that could underpin several hundred megawatts of geothermal power and that's really needed in the mid-west because if you look at the magnetite developers, Asia Iron, Karara, etcetera ... they're going to need several hundred megawatts of baseload power in the next few years and we think we're well placed to supply that," he said. They hope the water comes back to the surface fast enough and hot enough to create cheap, clean electricity that isn't dependent on sunny skies or stiff breezes – without shaking the earth and rattling the nerves of nearby residents. (Photo Courtesy AP, 2009.) Project manager Fred Wilson works at the Newberry Crater geothermal project near LaPine, Ore. Geothermal energy developers plan to pump 24 million gallons of water into the side of the dormant Central Oregon volcano during summer 2012 to demonstrate a new technology they hope will produce inexpensive power. Canaccord will help restructure “mezzanine debt and in the recapitalization of the company,” Vancouver-based Nevada Geothermal said today in a statement. The Pacific Centre for Geothermal Education & Research team is pleased to announce the opening of the 1st Student Essay Competition on Geothermal Energy. In his 2011 book, “World on the edge: how to prevent environmental and economic collapse”, Lester Brown indicated that the average annual world growth rate in geothermal power production was 3%. However, despite its location on the Pacific Ring of Fire, Canada has yet to commercially develop any geothermal power generation capacity. In contrast, Canadian use of low-grade geothermal energy for heating and cooling has been steadily on the increase in recent years. French company Alstom has announced the signing of a turnkey geothermal power plant contract worth US$38 million with CFE for the Los Humeros II Phase B plant in the state of Puebla, Mexico. Alstom announced it has signed a “turnkey geothermal power plant contract with Mexico’s Comisión Federal de Electricidad (CFE) in the Puebla state of Mexico. EPA has released greenhouse gas (GHG) data reported from large facilities and suppliers across the U.S. economy for the year 2010. (Traditional - Not including Geothermal) Power plants were the largest stationary source of direct U.S. GHG emissions with 2,324 million metric tons of CO2e, followed by refineries with 183 million metric tons of CO2e. CO2 emissions accounted for largest share of direct emissions with 95 percent, followed by methane with 4 percent, and nitrous oxide and fluorinated gases representing the remaining 1 percent. 100 facilities each reported emissions over 7 million metric tons of CO2e, including 96 power plants, 2 iron and steel mills and 2 refineries. Geothermal power production has a significant environmental advantage over burning fossil fuels for electrical power production. Electrical production from geothermal fluids results in an order of magnitude less CO2 per kilowatt-hour of electricity produced compared to burning fossil fuels. The Bureau of Land Management (BLM), Winnemucca District, Humboldt River Field Office is seeking public input as it initiates an environmental analysis process for a geothermal power plant and power lines as proposed by TGP Dixie Development Company, LLC. The BLM is inviting the public to submit comments on the proposed project by February 11, 2012. The project is proposed to be located on the northwest slope of the Stillwater Mountain Range approximately 25 miles east-southeast of Lovelock, Nevada. The project area would be within the boundaries of nine federal geothermal leases in Pershing County, Nevada. Alaska’s got an energy problem, but it’s not what you might think. Yes, prices are high and the oil isn’t coming any faster out of the North Slope. Maybe it’s time to think outside the Oil Patch. Alaska located far from population centers. The Himachal Pradesh government will explore the possibilities of exploiting the hot springs in the state to generate electricity, Chief Minister Prem Kumar Dhumal said on Friday. "An action plan to know the geothermal potential of the state will be prepared soon," an official statement quoting Dhumal said. Himachal Pradesh falls in the Himalayan geothermal province which ranges from Ladakh in Jammu and Kashmir to Assam, covering a vast swathe of geographical area and encloses over 150 thermal manifestations. Total new investment in clean energy increased 5% to $260bn in 2011, despite the sluggish global economy and a painful squeeze on manufacturers. However, geothermal slipped from $3.2bn to $2.8bn. Nome, Alaska, is running out of fuel. However, in 2007 a DoE study concluded that geothermal energy, followed by natural gas, and then wind combined with diesel, would all offer significantly less expensive alternatives than continuing to rely on diesel alone. The Kenya Electricity Generation has denied claims that it faulted procurement rules during the award of an Sh8 billion contract to a Chinese company for drilling geothermal wells. In reference to information contained in a monthly magazine claiming that the board of directors and managing director Eddy Njoroge breached the rules to benefit from the deal, the company says none of the claims is true. The research provides an understanding of the technology, key drivers and challenges in the global geothermal power market. It also provides historical and forecast data to 2020 for installed capacity and power generation. The founder and CEO of Foro Energy, Joel Moxley was named one of 3 energy innovators under 35 of an MIT list of 35 innovators under 35. Foro Energy is developing a thermal-chemical drilling process using lasers and fiber optic cables, which could be sold to geothermal power plant drillers, or other types of drillers, like the natural gas and oil industries. The traditional geothermal drilling tech takes time and wears out the drill quickly. Budget deficits drove the conversation in Washington in 2011 with the daily news dominated by government shutdown threats, the “super committee,” continuing resolutions, and arcane budgeting practices. Unfortunately, this left Americans convinced that government investments in the future are off the table because of large federal budget deficits that need to be reduced. The 2011 Australian Geothermal Energy Conference recently took place in Melbourne, bringing together both national and international industry leaders and experts to discuss geothermal potential, policy and projects in Australia, and overseas. The Indonesian State Enterprises Ministry said that Pertamina’s units Pertamina Geothermal Energy and Pertamina Drilling Services Indonesia may carry out IPOs this year. Pertamina controls 90 percent of PGE, which operates geothermal facilities. It also has a 99 percent stake in PDSI, which has 34 drilling rigs. The Edwards Wildman Palmer LLP Energy Group has updated the renewable energy and energy efficiency tax incentive summary they prepared last fall. The publication includes a table of incentives available to geothermal power producers at state and federal levels. This volume presents certain federal and state tax incentives promoting the renewable energy and energy efficiency industries. Each section outlines the basic features and regulatory requirements for a tax program which provides financial incentives for clean technology development through renewable energy and energy efficiency projects. Peppermill Resort Spa, Reno, Nevada, USA. 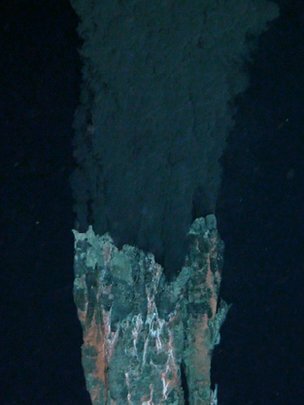 The vents are also known as "black smokers"
The world's deepest known volcanic vents are also the hottest, a UK-led expedition has indicated. The seafloor vents are located 5km below the surface of the Caribbean, in the Cayman Trough. The researchers say the structures are shooting jets of mineral-rich water more than a kilometre into the ocean above. The vents' features suggest the water is warmer than 450C - hot enough to melt lead. The Canadian Geothermal Energy Association will host a Technology Information Session February 7, from 11:30am-1:30pm in Calgary in collaboration with their partner the Petroleum Technology Alliance of Canada. An offshore geothermal power project by Eurobuilding in Italy is looking at drilling into one of the largest (underwater) volcanoes in the world, close to Sicily and Calabria. A potential EUR 2 billion project. Aboitiz Power Corp. has signed an agreement allowing its subsidiary to provide clean and affordable electricity to more than 43,000 customers of an electric cooperative in Abra. AP Renewables owns and operates the 289-megawatt Tiwi geothermal power plant complex in Albay and the 458.53-MW Makban geothermal power facility in Laguna and Batangas. In the petition before the High Court, the magazine wants power firm KenGen to allow it unhindered access to all information and documents relating to geothermal power contracts between the company and two others. In the test case, the magazine, published by lawyer Ahmednasir Abdullahi, demands access to special reports, board minutes and e-mails, otherwise confidential and high-level correspondence from KenGen. This is the first time since the enactment of the new laws that a media house is demanding to access all information from a State agency through a court process. Researchers are preparing for an educational conference on what could be another valuable addition to West Virginia's already impressive energy portfolio, potentially doubling current electrical generation capacity. It's been more than a year since researchers at Southern Methodist University announced findings of a study that identified significant geothermal energy potential in West Virginia, and the state has made little public progress in capitalizing on the study. That could change May 22 with an event hosted by Marshall University and the West Virginia Division of Energy. The electric utility on Hawaii island said it will soon begin soliciting bids from developers to supply it with up to 50 megawatts of geothermal energy. At the same time, Hawaii Electric Light Co. officials said they will undertake technical studies to determine the impact of that amount of integrating additional geothermal power into the island’s electrical grid. A free online atlas of renewable energy resources in the U.S.A. is now available courtesy of the National Renewable Energy Laboratory. Though designed for policymakers and planners, the new “RE Atlas” is a user-friendly interface that provides anyone who can use a computer with a vivid picture of the vast potential this country has for safe, low risk forms of energy including solar, wind and geothermal. The Secretary of Energy said the plant will be located in the northern state of Puebla. Mexico develops renewable energy, like wind energy, concentrated solar thermal power and photovoltaic solar energy. Mexico ranks third worldwide in geothermal energy generation with 959 megawatts, just behind the United States and the Philippines. In Mexico there are geothermal power plants in Baja California, Coahuila, Puebla, Michoacan and Jalisco. This year will open the geothermal energy plant Los Sumeros in the state of Puebla, which is a project that has been working for the past year the federation and the state. Ormat Technologies’ recent troubles at its Carson Lake project in Churchill County underscore the gamble geothermal developers take when trying to bring new projects online. Ormat recently pulled the plug on a power purchase agreement signed in 2006 with NV Energy after delays in bringing online the proposed 30-megawatt Carson Lake geothermal plant. Ram Power, Corp. said it has commenced commercial operations the Phase I expansion at San Jacinto-Tizate geothermal power plant. Geothermal power is a growing part of New Zealand’s renewable energy portfolio, with world-leading technology being used to exploit the immense heat under the central North Island. Gisborne-based Eastland Group has become a niche player in recent years, buying a geothermal plant in Kawerau then an undeveloped field nearby. Indonesian state-owned power producer Perusaahan Listrik Negara expects to generate an additional 135 megawatts of electricity from its three geothermal power plants that are set to go online this year as part of its plans to boost capacity across the nation. OrCal Geothermal Inc. has three PPAs for its geothermal plants and CE Generation, LLC has seven PPAs that will shift to SRAC pricing in 2013. California's latest clean energy legislation, the Qualifying Facility (QF) and Combined Heat and Power (CHP) Program settlement, is designed to reduce greenhouse gases and establish a CHP framework for investor-owned utilities. The settlement replaces an older version that required investor-owned utilities to contract capacity from CHPs at their avoided cost of generation. U.S. Geothermal Inc. announced it has received approval on an amended power purchase agreement for energy provided by its San Emidio Project to the Sierra Pacific Power Company (SPPC). LaGeo, a Salvadoran geothermal company, has decided to start geothermal exploration in El Salvador in order to find new geothermal wells for power generation. After a pause of several years, LaGeo has allocated USD 41 million for this purpose in 2012. The investment plan includes exploration, recovery and maintenance of the wells. The main focus areas of the exploration are the fields of Chinameca and St. Vincent. The Research Council of Norway has granted NOK 24 million to the four-year project NEXT-Drill, in which scientists and industry will develop the technology and tools needed to produce geothermal heat from the earth. Geothermal heat is available all over the world, and is a clean, stable, inexhaustible, and “weather-proof” source of energy. At Norway’s latitudes, the ground temperature rises by about 20 degrees centigrade per kilometre into the crust. Power from this source of energy could play a significant role in the global green energy mix, the group said.